Highly recommended for any chorus-seeker. Excellent range of chorus tones at bargain price . Battery changing is a pain. Stoner-rock bassists with shallow pockets rejoice! Here's a chorus pedal that allows you to sound like you're from Palm Desert back in 1991 for a measly 59 quid. 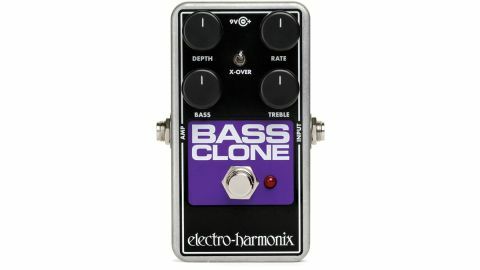 Based on EHX's established guitar chorus, the Small Clone, made popular by Kurt Cobain among other rockers, the Bass Clone offers you a simple but effective range of controls. The Depth pot controls the modulation of the effect - in other words how much soupy chorusy tone is slathered all over your dry signal - while Rate manages the speed of the chorus, or how quickly the sound rises and falls. You can have a lot of fun combining the two: for example, max out Depth and roll off Rate and you get a spooky, rich sound that isn't so much chorus-like as a doubling or tripling of your bass tone. Once you hear that tone, you don't actually want to switch it off. Add a touch of distortion from the drive pedal of your choice and you're supplied with a massive presence by any standards. Maximise Rate and you get that wibbly, slightly seasick tremolo that sounds great on guitars but a bit comedic on bass, unless, that is, you're playing low-register lines that don't reveal the effect so much. Then you've got Bass and Treble cut and boosts, which to my ears work best when you push up the low end and centre the top: in that configuration your tone sounds truly monstrous. Add a touch of distortion from the drive pedal of your choice and you're supplied with a massive presence by any standards. The X-Over switch is a subtle effect that cuts low end from the wet signal, which is useful if your PA is a bit boomy, but should otherwise be applied with care. The build of the pedal, like all EHX products that we've seen in living memory, is solid and presumably difficult to break. Essentially it's a lump of metal that you can (probably) drop down the back of the van and retrieve unbroken. The red LED is big enough to be visible to stressed, drunk or otherwise incapable roadies too. Changing the battery could be easier in this player-friendly era, mind: you need to remove four screws to do so. If you're as impatient as we are, this will be annoying. Otherwise, there is no downside to this ace little pedal. At this price, you'd be mad not to try it out if chorus tones are your thing.